Pierre Gagnaire : "I want my restaurant to be a place that feels open, meaning dynamic, living in present, looking to the future but respectful of the past and never losing sight to its objective : to give pleasure through its cuisine, a generous and lively cuisine, which takes risks and as my critics say, occasionally goes overboard. I trust that these people will forgive my over-enthousiasm." - One of the most exclusive restaurant in Paris. Reservations should be made at least one month in advance. Pierre Gagnaire is a well known French chef, and is the Head Chef and owner of the eponymous Pierre Gagnaire restaurant at 6 rue Balzac in Paris. 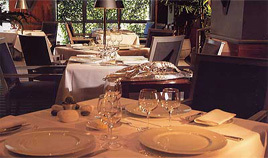 The restaurant is considered one of the finest in France, specializing in 'Modern French' cuisine. Gagnaire is also Head Chef of Sketch in London. In 2005, both restaurants were ranked in the top 20 in the world by industry magazine Restaurant, and in 2006, Pierre Gagnaire was ranked third. More about Pierre Gagnaire on Wikipedia. About this website : We have listed the best places to dine in Paris : Be sure you hit the best restaurants or the best bargains for food while you are there. Paris cafes are possibly the most well-known image of the City of Light.